Milano cookies. You know what we’re talking about, yes? The buttery cookies made by Pepperidge Farm that are darn near impossible to not inhale by the fistful? This is the homemade version. And they’re better than you can even imagine. 1. In the bowl of a stand mixer fitted with the paddle attachment, beat the butter on medium speed for 5 to 10 seconds. Add the sugars and mix on low speed just until incorporated. Increase the speed to medium and beat the butter mixture until it’s aerated (that means fluffy) and looks like frosting, 2 to 3 minutes. Scrape the sides and bottom of the bowl with a rubber spatula to everything together. 2. Pour the milk and vanilla in a liquid measuring cup. In a bowl, whisk together the flour and salt. 3. Add the milk and vanilla to the butter mixture in the bowl and mix on medium speed for 45 seconds to 1 minute, or until nearly completely incorporated. 4. Add the flour mixture to the bowl all at once and mix on low speed until everything just comes together, approximately 30 seconds. Scrape down the sides and mix for another 30 seconds to a minute to ensure the batter is homogeneous. Remove the bowl from the stand mixer. With a plastic bench scraper, bring the batter completely together by hand. 5. Fit a pastry bag with the Ateco tip #895 and fill it with the cookie batter. 7. Holding the pastry bag at a 90-degree angle, pipe 3 rows of 2 1/2-inch-long strips of batter onto the parchment, up to 20 cookies per pan, using the folds in the parchment paper as a guide. As you pipe, keep the pastry tip close to the parchment paper. To release the cookie batter from the tip, run the tip back over the top of the cookie. Refrigerate the sheet pans until firm, at least 20 minutes, working in batches if refrigerator space is limited. 8. Heat the oven to 350°F (177°C). 9. Bake 1 pan of cookies at a time for 10 minutes. Rotate the pan and bake until the edges are golden brown and the tops are firm, 4 to 6 minutes more. Let the cookies cool completely on the pans. They ought to crisp as they cool. Meanwhile, bake the remaining cookies, 1 pan at a time. 10. When you’re ready to assemble the Milano cookies, in a stand mixer fitted with the paddle attachment, whip the hot fudge until it lightens to the color of milk chocolate and looks like frosting, 3 minutes. 11. Fit a pastry bag with the Ateco tip #895 and fill the bag with the hot fudge. 12. Line 2 half sheet pans with parchment paper. Sort through the cookies and pair them in sets of 2 cookies of almost identical or similar size. Turn half the cookies over. Pipe even strips of hot fudge down the length of the upturned cookies, leaving a small amount of room at the ends. Top each frosted cookie with the flat side of a second cookie and press lightly to adhere. Though this Milano cookies recipe requires a little time and effort, the end result is a buttery, fudgy indulgence. The folding of parchment paper made piping the strips of batter easy. I baked 1 sheet of cookies at a time. I had the browned edges but the inner portion of the cookies were on the soft side, so I turned the oven off and left the cookies inside for about 30 minutes. They were crisp at this point. The hot fudge sauce is easy to make and spreads easily. The end result is homemade Milano cookies that taste better-quality than store-bought Milanos. The cookies taste buttery and the chocolate is fudgy. I made the second batch with a thicker layer of fudge. These copycat Milano cookies are very tasty, but when it comes to making them, they’re not for the faint of heart! You absolutely do not need the Ateco pastry tip, which even in a town the size of Atlanta was impossible to find. I used a disposable Walton pastry bag with no tip. The key is to hold the opening of the pastry bag on the parchment as you move it to keep the cookies thin. I found it far simpler to pipe 3 continuous lines, rounding the ends at the beginning and end with a short segment in the middle as the second stroke. It may take a bit of practice but your technique will improve with each cookie. Making the cookies and the fudge at the same time led to problems for me. I highly recommend making the fudge the night before and refrigerating it overnight in a disposable piping bag. This will allow for a much more satisfying baking experience. Piping the hot fudge onto the cookies was pretty routine, and the end result was great shortbread-like cookies with a rich and super fudgy center. 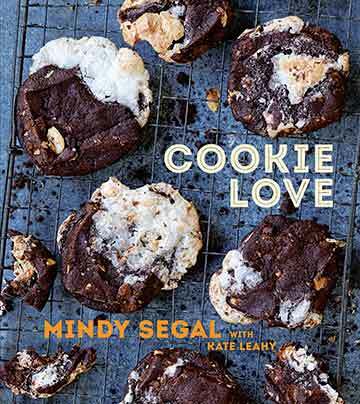 Milano Cookies Recipe © 2015 Mindy Segal and Kate Leahy. Photo © 2015 Dan Goldberg. All rights reserved. All recipes and photos used with permission of the publisher.